World Water Day – Weaving through the River. World Water Day is about focusing attention on the importance of water. The theme for World Water Day 2018 is ‘Nature for Water’ – exploring nature-based solutions to the water challenges we face in the 21st century. It is about looking for ways we can reduce floods, droughts and water pollution by using the solutions we already find in nature. Damaged ecosystems affect the quantity and quality of water available for human consumption. Today, 21 billion people live without safe drinking water at home, affecting their health, education, and livelihoods. The next time you brush your teeth and let the water run down the drain or fill a glass of water to drink and pour half of it down the drain or take a 20-minute shower, think about what a privilege it is to have a dependable source of fresh water and how many in this world do not. Wherever you are and whatever you do today, make a point to consider nature and water. And if you want to do something about it, consider visiting www.we.org where you can donate $25, which can provide one person with clean water for life. This original mixed media art I created is being dedicated to World Water Day. It was done using ink-dyed tissue paper and drops of ink on Arches 140lb watercolor paper. I added torn pieces of some old sheet music for “Weary River” sealed down with gesso. 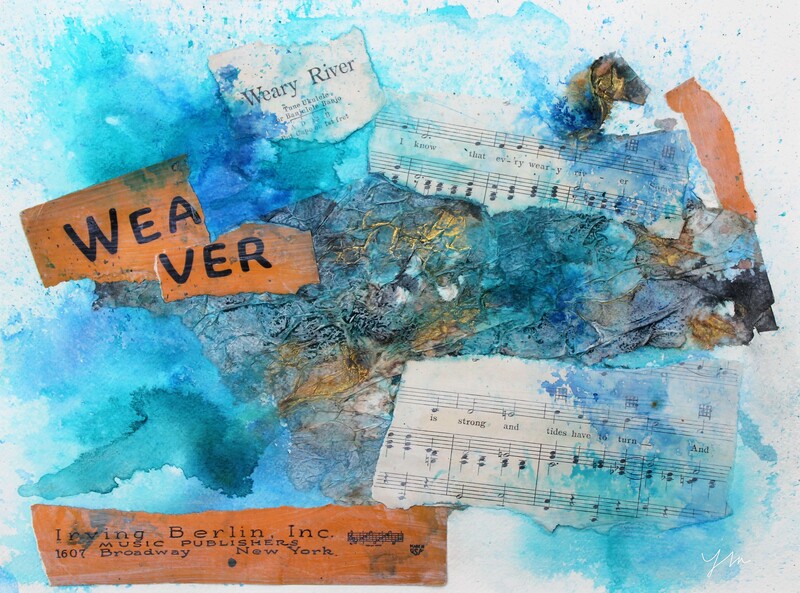 I purposely tore the title words to form the word “Weaver.” It makes me think about how water and art and music weave through our lives and make an impact. Beautuifu painting and beautiful words Jodi. Totally agree that beauty if found from within. Sorry Jodi. Was a bit mixed up when looking at your posts this Am. The comment i just posted had to do with your previous post about beauty and what truly defines it. Concerning today’s post….beautiful and creative artwork as usual. Yes, totally agree water is very preciious and we need to appreciate it and not take it for granted. Many people in other parts of the world are not as fortunate as we are with such an advanced ecosystem. Beautiful 🙂 I shall attempt water in watercolor tonight. Beautiful artwork. Great that you can Donate this piece. How do you do that? And what do they do with it? Living in California we are acutley aware. Most of our restaurants do not serve water unless you request it. Glad they have a world day for it. Your water colour and description is a fine contribution to the World Water Day. The importance of water as a source of life for our parched planet cannot be overemphasized. Let us think water today and how we can help conserve it. A beautiful piece of work with an important message to all. Using the music title to create Weaver is brilliant! Good to know about World Water Day, thank you! And excellent art piece. I love mixed media and wish I had more time to do it myself. Nice work! Nice work, Jodi! This post reminds me of once again visiting Hoover Dam the other day. Lake Mead needs that precious water! My shower is never longer than needed to save water. I’ll never forget my visit to Hoover dam. Fascinating. Benjamin and I love this mixed media art and reading about World Water Day. “I never let the water run.” says Benjamin. He is very careful of not wasting water during tooth brushing and hand washing, tubby time…not so much. A marvelous way for raising awareness about the valuable gift of water and the need to protect and conserve it with your beautiful art and words. Thank-you x 2!! Hi Jodi, and important and reminder of our vulnerable environment. Your mixed media art well describes your post. It is raining today in California, helping our ongoing drought. Really neat mixed media painting, and lovely color palette Jodi! I’m fascinated how you’ve hit on a really serious issue that affects all of us on the planet and encapsulated it in this fantastic artwork. I just gazed and gazed at the large version. I’m hankering to share it on my blog … I was kinda thinking of doing a ‘water” theme post anyway and I feel energised by what you’ve shared! If I go ahead, may I include this wonderful artwork in the post? I’ve appreciated, and learned from, all of the news and posts about water awareness. It is mind boggling to think of the people who cannot freely drink water, or wash themselves, because it’s just not there.